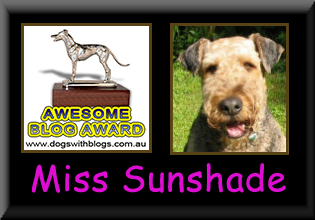 Life of Miss Sunshade - The Vancouver SuperDALE: Vote for us please? I'm so sorry we've been away for so long..... but we are all well!! Life has been very busy so mum hasn't had time to help me blog. Although, she has been taking pictures of my adventures. I hope soon I'll be able to share my adventures with all of my friends! Mum has entered me (Mum: and Jaffa) in Fido's casting call for their next TV commercial. 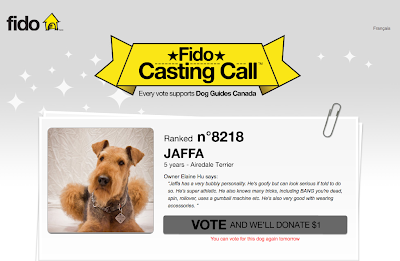 I hope you can vote for me (Mum: and Jaffa too please!)! 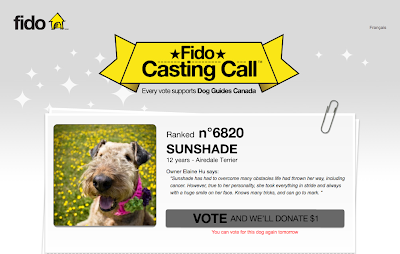 For every vote, $1 is donated to the Canadian Guide Dog's association. A win win situation. The contest ends November 17th, you can vote everyday if you like me THAT much (and I hope you do!)!! You and Jaffa have our votes and we'll keep voting. Tell your mum to post pictures of your new adventures on your blog soon. Hi E, Miss Sunshade and Jaffa - done x 2. Yeah we like you guys THAT MUCH so we'll try to remember to do it everyday. WHO came to see ME?? ?